Last night was a great tribute to Nomar Garciaparra... someone whom I have already saluted on the blog. 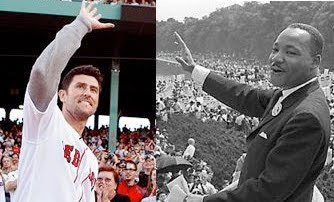 It was wonderful to see whatever ill will existed 5 or 6 years ago between management and Nomar has been put aside to remember what a terrific Red Sox player he was. But of course it is Boston... the city of my youth... and these are Red Sox fans... and I am one of them... and someone HAS to say something nuts. 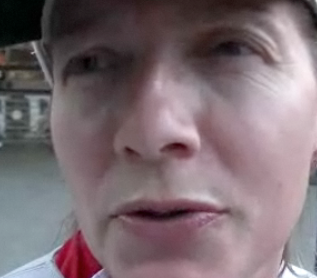 And that person would be this lady, who appears in a Boston Globe video posted by Dirt Dog guru Steve Silva. She compares the night that Nomar got traded to one of those days you all remember like "when Martin Luther King got shot." I'm just glad they cut away before she took the analogy further. "And you know Dr. King died defending racial justice and Nomar was traded and it lead to the Sox winning the 2004 World Series... so he sacrificed himself for a greater good. I just can't figure out who was more noble." It's one of those moments where I can't figure out if I am proud or ashamed to be a Sox fan. I guess a funny combination. Here's her clip... it's right after the band plays up top. That's one of those moments where I can't figure out if I'm proud or ashamed to be a human. I has nothing to do with being a sox fan, this lady is just an idiot. There are idiots in every baseball stadium, including the guy that decides to put the mike in their face. Thanks Tony... I think I was having some fun. The Negroes went on to win a World Championship after MLK was shot? The best pitching match up of the year! How much does Zack Greinke hate Tyler Clippard? NAME THAT RED SOX PLAYER! Who should I root for in the Stanley Cup Finals? Hey get your red hot aces here! Now THAT'S a dumb loss! Of COURSE the Royals would be too tough to beat! We interupt the baseball talk to say AAARRRRGHHH! Who is Dan Haren laughing at? THE GIANTS? Seriously Giants... no rush in getting a new bat! More of THIS Dice-K please! They can never JUST LOSE, can they? WHAT WAS SO HARD ABOUT THAT? IT'S A MIRACLE! THE GIANTS BEAT THE PADRES! Why didn't I listen to my instincts? Should Kevin Gregg get a save for this game? Did we all just miss the best game of the year? Not THIS TIME, Tyler Clippard! I told you not to panic! Which way should the Mariners turn? Can the Bay Area reverse October 2, 2004? Was it turn back the clock day in Philadelphia?